You probably don’t remember exactly where you were on the morning of Jan. 24, 2015. John Peltz does. He was standing in front of his West Mariposa Street home, two blocks south of the main entrance to Grand Canyon University, watching more than a dozen GCU students dutifully putting siding on his house and replacing his fence. 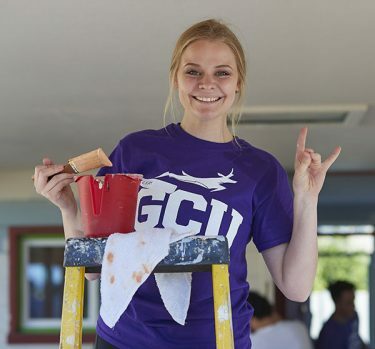 Homeowner John Peltz couldn’t stop smiling as he watched GCU students work on his house for the fifth time in less than four years. 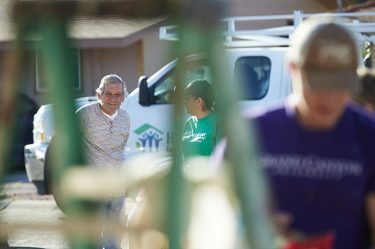 It was the first day of GCU’s Canyon Corridor partnership with Habitat for Humanity, and he had been the first homeowner to sign up to have his house renovated at a vastly reduced cost. Numero uno. The project’s pied piper. So here he was again Saturday morning in the same spot, this time watching students put a new coat of paint on the place he has called home for more than four decades. It was the fifth time he had utilized the program and the second time he was having his brick house painted. Just another project on just another day of community outreach? Hardly. It was the semiannual Serve the City, and it was a day of milestones. 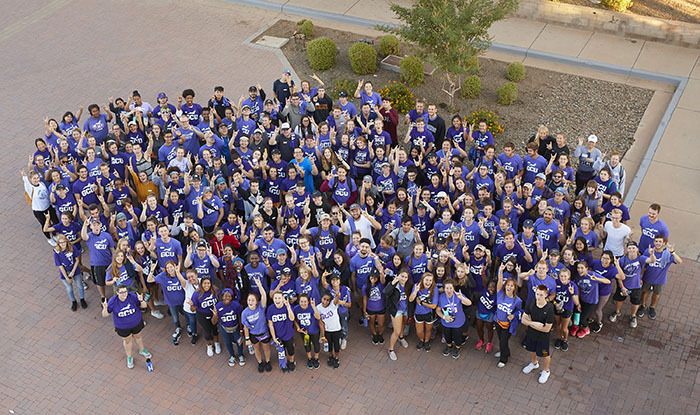 It was the day the initiative, with a goal of working on 700 homes in GCU’s neighborhood, passed the 200 mark in families served, 450 in repairs and 3,500 in volunteers. “It just keeps going and going, getting stronger and stronger,” said Jason Barlow, CEO of Habitat for Humanity Central Arizona. And no one seems more grateful than Peltz, whose level of appreciation went far beyond the box of doughnuts he bought the students (“It won’t kill me after what I saved”) and the big smile on his face. Leah Cave, like many of the students, was taking part in Serve the City for the first time. But here’s the catch: All these students were in high school in January 2015. Not many of them had even heard of GCU, and they certainly hadn’t heard much, if anything, about the Habitat partnership. It keeps going and going because fresh crops of volunteers keep making it stronger and stronger. “I was probably sitting in a high school classroom, probably hearing about something I didn’t care about at the time,” joked Leah Cave, a sophomore from Windsor, Calif., who cares about her education an awful lot – she’s a double major in psychology and sociology with a minor in counseling. She also cared when, like many of the other students hard at work Saturday, the need for Serve the City volunteers was announced at Chapel. “When I was younger, my church would do events similar to this,” said Cave, looking up at the eave she was painting in Peltz’s carport. She signed up right away. Freshman Andy Vigil, a pre-med student from Queen Creek, had heard a little bit about the Habitat project while in high school at American Leadership Academy, and his impetus to work Saturday came from a class that required a volunteer project. But he didn’t need much of a push. Across the street were more examples of Peltz’s influence on neighbors and the new students’ confluence for people in need. Emma Korte (in white T-shirt) and several members of the Global Outreach team did some landscaping. The homeowner there, Steven Serna, hadn’t heard of the Canyon Corridor project until Peltz told him about it several weeks ago. Serna wasted no time signing up, and Saturday he was having the house painted and landscaped. Many of the students working there are on the same Global Outreach team. “It’s like a bonding experience,” said Emma Korte, a junior from Omaha, Neb., majoring in behavioral health science. The students all had received a hot breakfast in front of the Student Union before walking to their job sites, but they didn’t need to be enticed to get up early. It wasn’t always this way. Even on that first morning in 2015, when Peltz stood in awe watching all that hard work get done (“Honestly, I wouldn’t be able to do it,” he said), there was a getting-to-know-you adjustment period. “When this all started, the neighborhood was a little apprehensive. There was a little fear, and they just didn’t know what to expect,” Barlow said. “And I think, basically, everybody has just been killed with kindness. They’ve absolutely seen the immense outpouring of love that GCU shows for this community. Just for fun, the students gave a door a GCU touch before painting over it. When Barlow met early Saturday morning with the men and women who volunteer regularly for Habitat (the “yellow shirts”), he was taken by how much they enjoy working with the students. Joe Genovese is one of those volunteers. He, too, was there on Mariposa Street that January morning in 2015. He has seen the project blossom. 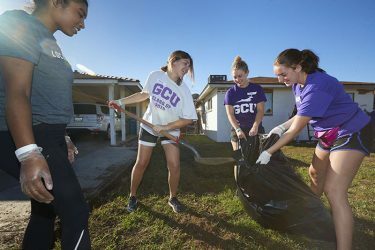 When Genovese spoke to the students at the start of Saturday’s work on Serna’s home, he urged them to make service a regular part of their lives long after they leave GCU. He had a sense that they most certainly will. “They’re all fantastic young adults, and it’s such a privilege to work with them, it truly is,” he said. Maybe not as happy as John Peltz, but close. And when that goal of 700 homes is reached, the work again will be performed by a new group of students. It just keeps going and going.